Andalusia's capital is famous for its flamenco, bullfights and beautiful buildings. It’s a city that’s steeped in history, religion and a passion for the good life. The Andalusian city of Seville is located on the banks of the Guadalquivir River and is rich in historical, architectural and cultural treasures. The Catedral de Sevilla (Seville Cathedral) is stunning in its sheer size, containing impressive gilded images. Beside the cathedral is La Giralda, the bell tower that was once a minaret. On the other side of the square stands the great Real Alcázar (Royal Palace), where more than a thousand years of Christian and Moorish design collide in spectacular fashion. The people of Seville are known for their passion, which is reflected in the two major festivals held before and after Easter. Semana Santa de Sevilla is one of the largest religious processions in the world, while the Feria de Abril will give local residents a chance let their hair down during a week of festivities, full of flamenco and other treats. Seville is reputed to have one of the highest concentrations of pubs in all of Europe. Not surprisingly is has a reputation as a major party town. Start your evening with a plate of juicy olives, some delicious ham and patatas bravas (fried potatoes with a spicy sauce) in one of the many tapas bars. Then go to a gig or catch football match in Seville's La Cartuja, one of the largest stadiums in Spain, before hitting the bars and clubs around town. In Seville it’s easy to watch those pennies; public transport is excellent, inexpensive and regular bus services run to all the important places. Explore the city at a slower pace by hiring a bicycle through the public bicycle rental program, Sevici, or choose to stay near the old town, where most of the important historical attractions are, so you can explore the area on foot. 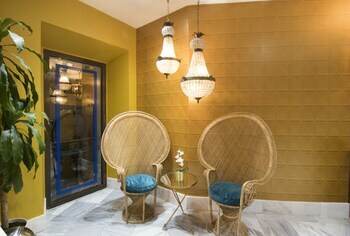 The number of visitors drops during the summer months when the temperature rises to a scorching 36 ° C. The best time to visit is during the autumn or spring, which is also when the festivals are held. See Columbus’ tomb, artwork by Goya and Murillo and plenty of breathtaking architecture all within the largest Gothic cathedral in Europe. Once among the tallest religious monuments in the world, this former minaret is now the eye-catching bell tower to Seville Cathedral. Discover a millennium’s worth of royal treasures in this architectural masterpiece in the heart of Seville. 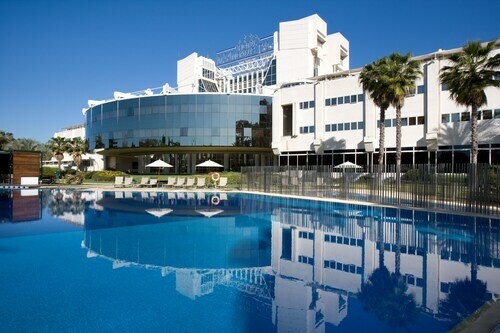 Catch a concert or sports match at one of the largest stadiums in Spain. 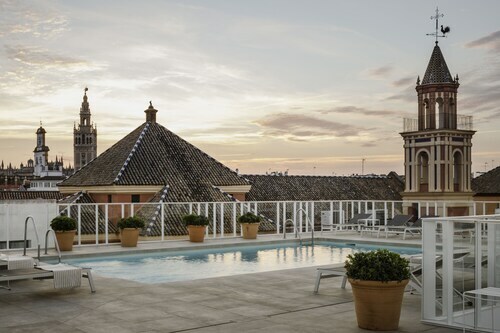 Spend time admiring the fountains, bridges and painted ceramic tiles in Seville’s most impressive plaza, then sample tapas in restaurants surrounding the square. 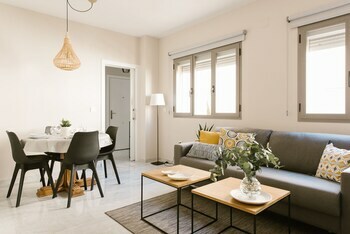 Book a holiday in El Arenal to discover one of the most lively neighbourhoods in the Andalusian capital. Delve into the city’s maritime past and gain insights into the voyages of Christopher Columbus during a tour of this 800-year-old defensive structure. Learn about the importance of bullfighting to Sevillano culture with a behind-the-scenes experience at this well-known bullring. Visit restaurants and bars, go shopping, explore and relax at this attractive and spacious tree-shaded square in the center of Seville. Go for a wander in one of the largest parks in Seville, a landscaped public space with a canal, leafy avenues, museums, water features and historic buildings. Spend a couple of hours inside a former convent to explore 600 years of Spanish art, including masterpieces by Seville’s greatest Baroque painters. 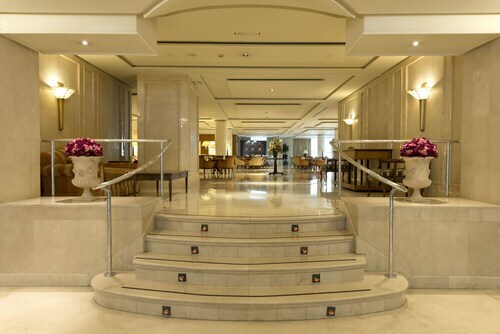 Located in Sur, this hotel is within 1 mile (2 km) of Nervion Mall, Plaza de Espana and Alcazar. 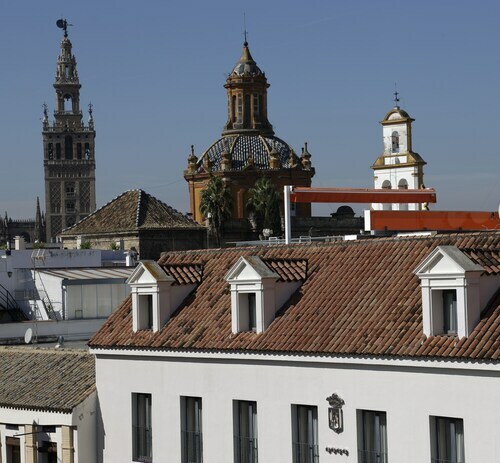 Giralda Tower and Seville Cathedral are also within 1 mile (2 km). Seville San Bernardo Station is only a 5-minute walk and Gran Plaza is 18 minutes. 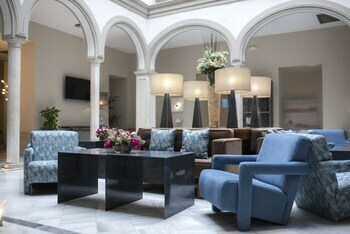 Located in Historical Center, this hotel is within a 10-minute walk of Santa Maria la Blanca Church, Giralda Tower and Alcazar. 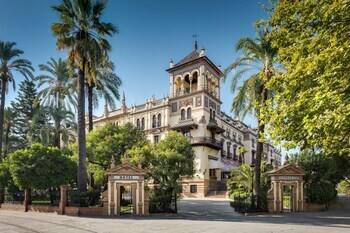 Seville Cathedral and University of Seville are also within 10 minutes. 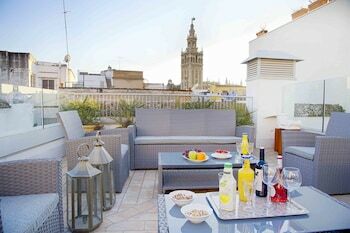 Puerta de Jerez Station is 15 minutes by foot and Seville San Bernardo Station is 17 minutes. Located in Historical Center, this spa hotel is within a 10-minute walk of Santa Maria la Blanca Church, Alcazar, and Giralda Tower. Seville Cathedral and University of Seville are also within 10 minutes. Puerta de Jerez Station is 14 minutes by foot and Seville San Bernardo Station is 16 minutes. Located in Historical Center, this luxury hotel is within a 10-minute walk of Museum of Fine Arts, Plaza Nueva, and Metropol Parasol. Giralda Tower and Seville Cathedral are also within 15 minutes. 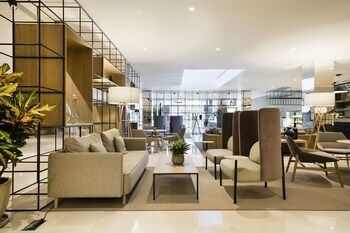 Puerta de Jerez Station is 18 minutes by foot and Seville Santa Justa Station is 28 minutes. 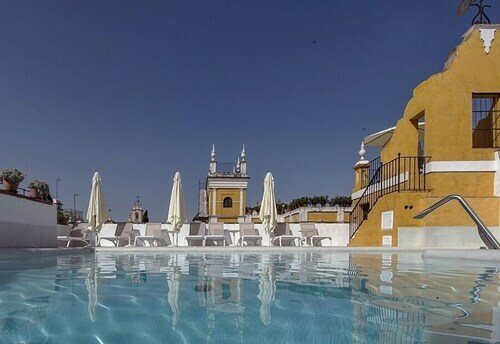 Located in Historical Center, this hotel is within a 5-minute walk of Santa Maria la Blanca Church and Alcazar. Giralda Tower and Seville Cathedral are also within 10 minutes. 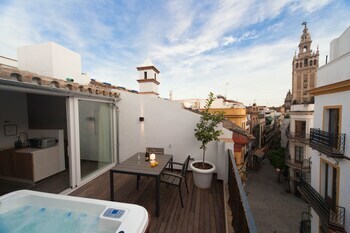 Puerta de Jerez Station is 12 minutes by foot and Seville San Bernardo Station is 17 minutes. 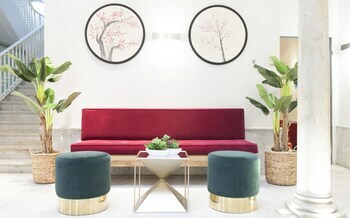 This family-friendly Seville hotel is located in Bellavista-La Palmera, within 1 mi (2 km) of Virgen del Rocio University Hospital and Benito Villamarin Stadium. Plaza de Espana and Alcazar are also within 3 miles (5 km). 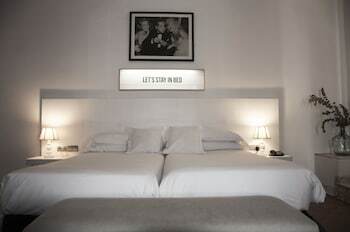 Located in Historical Center, this hotel is steps away from Plaza de Armas Shopping Center and Museum of Fine Arts. Plaza de Armas and Plaza Nueva are also within 10 minutes. Puerta de Jerez Station is 18 minutes by foot. 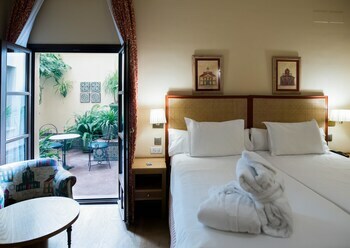 Located in Sur, this hotel is within a 15-minute walk of Plaza de Espana and University of Seville. Alcazar and Seville Cathedral are also within 1 mile (2 km). 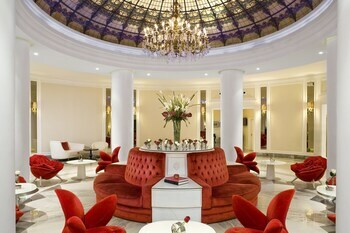 Seville San Bernardo Station is 5 minutes by foot and Puerta de Jerez Station is 15 minutes.